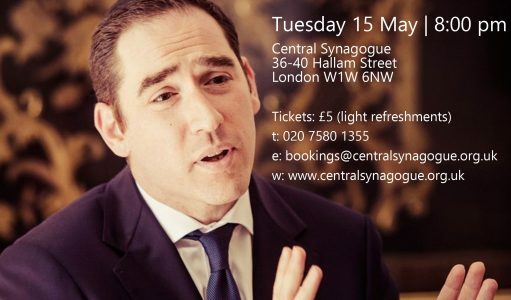 Central and New West End Synagogues are delighted to present a lecture by Rabbi Joseph Dweck, Senior Rabbi of the S&P Sephardi Community of the United Kingdom. Rabbi Dweck is American born and has lived in Los Angeles, California and Brooklyn, New York. He studied in Jerusalem at Yeshiva Hazon Ovadia under the tutelage of former Sephardi Chief Rabbi Ovadia Yosef z”l. He also studied psychology and philosophy at Santa Monica College in California and received a Bachelor of Arts degree in Liberal Studies from Excelsior College. Rabbi Dweck received his Semikha (rabbinic ordination) from Rabbi Ovadia Yosef under the auspices of the Sephardic Rabbinical College of Brooklyn, New York. He received a Master of Arts Degree in Jewish Education from Middlesex University at The London School of Jewish Studies.